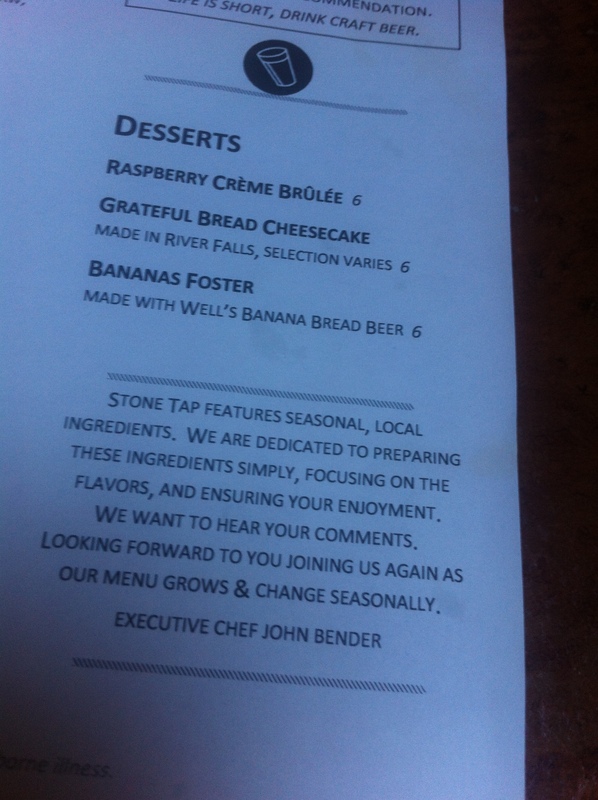 Stone Tap – Hudson, WI | Season It Already! Posted on August 8, 2013 by Carrie @ Season It Already! After our app, wine and port adventure visiting Jared at Urban Olive and Vine, we knew that we wanted to explore that cute little main street in Hudson a little further. It was a beautiful day, so we walked over to a restaurant that Jared had recommended so that we could sit right along the river. Ahem… It was a beautiful day, so the wait for a seat was an hour and 45 minutes. There was a selection of a couple dozen taps categorized on dated paper menus listed from light to hoppy to rich. I love that because that means they are always changing! Bottled beers and wines were included on the menu as well. I especially liked the UP NEXT teaser. A great reason to push a tap and get people to come back! 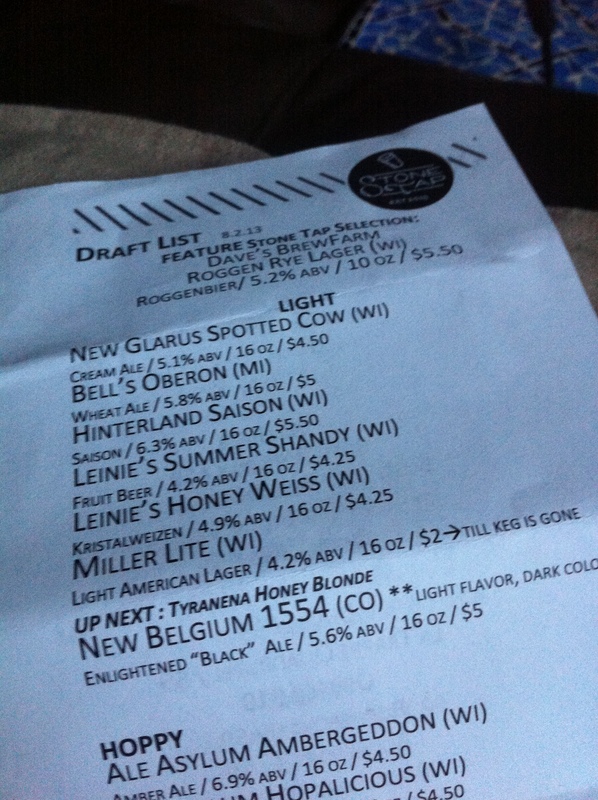 But my decision was made when I saw a Specialty Tap listed. 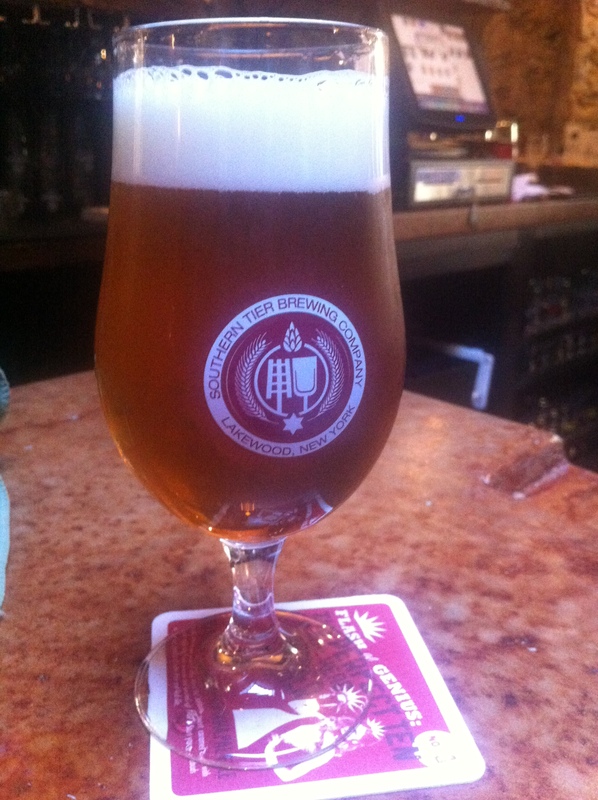 It’s an ale that I’ve only had on tap once before, so I knew it was a must. But was it too soon? I decided it wasn’t too soon for this scrumptious, well-balanced fall beer. As much as I’d like to hang on to summer as long as I can after the winter we had last year, I also know that as we near the end of autumn, this beer is hard to find! I knew I had to have a glass while I could! They even had a Leinie’s Big Eddy Series beer on tap. The Big Eddy Series is Leinenkugel’s answer to craft beer. I am so glad they are branching out from their mass produced best sellers! 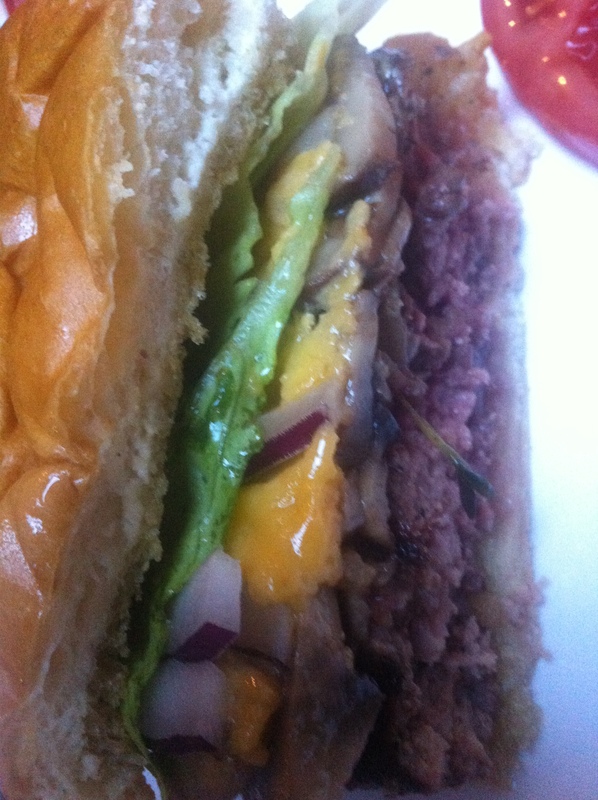 And since we had already enjoyed a nibble plate over at UO&V, I suggested that we split a burger. This way we could indulge, but also control our portion sizes. This basic burger is incredible. “Why?” you ask. At times like these, my bet is that it’s due to the local, fresh, high quality ingredients. There’s something to be said about the farm-to-table movement. The house-cut fries were pretty decent, too. We ordered a side of smoked blue cheese sauce. That is the first blue cheese sauce in my life that I haven’t liked. I had to do everything I could to get the taste out of my mouth. Rob agreed. 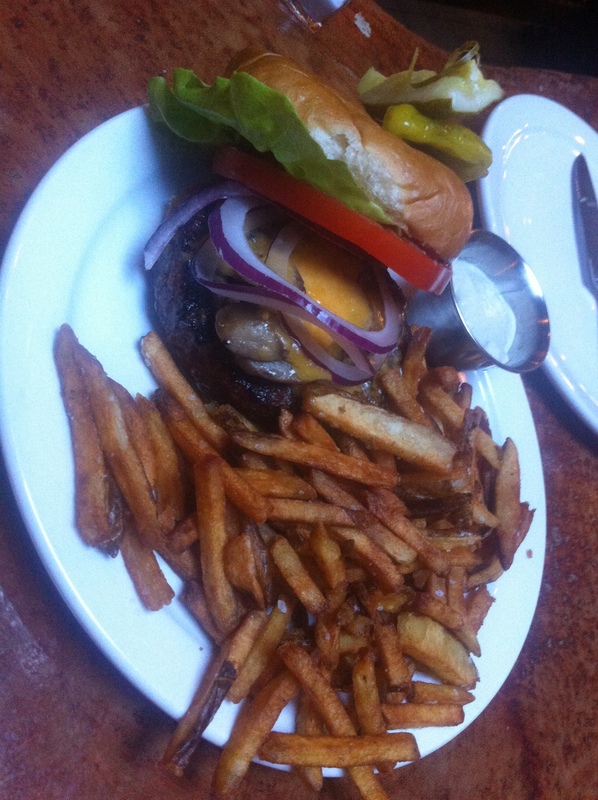 He unconsciously dipped his fries and his half of the burger into the sauce a couple of times and said, “Ugh. Why did I do that?” Force of habit, I’m sure. But, honestly, that is the only thing I didn’t like about the place. I liked the stone walls, the ambiance, the tap selection, the food, the bartenders, the service. Incredible. Especially since they’ve only been open since July 1st! If you are a craft beer lover like we are or enjoy restaurants that serve local, season ingredients, get ye to the Stone Tap. What is our favorite food to eat in season? What do you eat or drink out of season? I visited on Sunday! >>http://wp.me/p2tTkJ-zu I’m glad you enjoyed it! 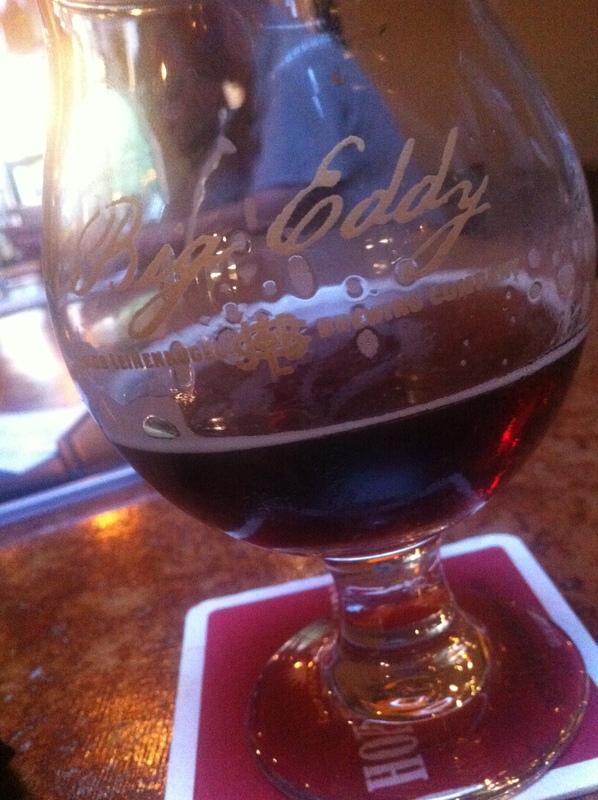 The beer selection was excellent, and I love the Big Eddy series, too. I drink IPAs year round. Don’t care that they aren’t a “summer” beer. I love them! Me, too! I don’t even know what season they are meant to be drunk in! Really. Pingback: Buffalo Tap – Savage | Season It Already! Pingback: An Apology: It’s Pumking not PumpKing | Season It Already! Pingback: Fantasy Draft Friday | Season It Already! Pingback: Pitchfork & Paddy Ryan | Season It Already!